WHITE-PAINTED HULLS are characteristic of fruit-carriers. The Eros 5,888 tons gross, was built in 1936. She is a single-screw steamship with an overall length of 431 feet and a beam of 54 ft 6-in. 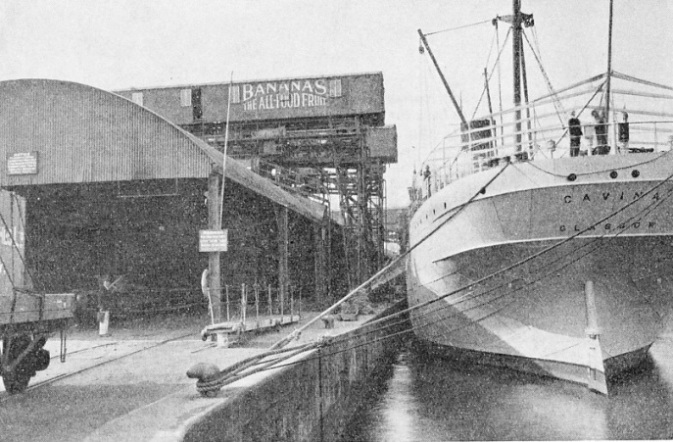 She has a raked stem and a cruiser stern, and is designed mainly for the Central American and West Indies banana trade. TO most of us the Caribbean Sea, with its palm-fringed islands, dazzling white beaches and superb scenic effects, is still in imagination the Caribbean of our extreme youth, the haunt of pirates, the home of hidden treasure hoards. The tourist agencies play upon this fact, but even so to-day all is changed and the rum for which men gave their lives is expensively served in the cocktail bars of cruising liners and in luxury hotels. But Romance is not dead, for the Caribbean now is the home of a trade which is almost world-wide. It is the operating area of trading concerns which in enterprise, in possessions and in tonnage owned, are the modern equivalent of the old Merchant Adventurer companies. The Caribbean Sea is one of the centres of the banana trade, the converging point of the routes of the fleets owned by the United Fruit Company and others. It is. one of the king-pins of the fruit trade, and this in turn is one of the most vital outlets of world shipping at the present time. Until recently few fruits could claim to have fleets of ships devoted exclusively to their transportation, and in this respect the banana was predominant. Its importance is still undeniable, but its predominance is now shared by citrous fruit and by deciduous fruit. The civilized world, with the possible exception of America, does not normally employ the banana as a breakfast food, but uses it lavishly for dessert purposes. People do, however, demand grape-fruit for breakfast, and clamour for oranges and the fresh fruits of the tropical and subtropical regions of the earth. Thanks to refrigeration, these fruits are brought in first-class condition to our tables, whatever the season and whatever the meal. It is the fruit ship which makes this possible. The trade started because an enterprising New Englander, Lorenzo D. Baker, returning to Boston in the Orinoco, called in at Morant Bay, on the picturesque and fertile island of Jamaica, to collect bamboos for paper making. More out of curiosity than for any other reason he took back a few bunches of bananas with him. These proved so profitable that he resolved to make several trips a year to Port Antonio, in the same island, with the 120-tons schooner Eunice D. Newcomb. Later more vessels were added and the firm of L. D. Baker and Company was formed. This later became the Boston Fruit Company and finally the United Fruit Company, which now owns plantations, wharves, sugar mills and refineries, passenger ships, hotels and radio service. It is an organization with branches in half the capitals of Europe. Directly or indirectly it has stimulated the building of hundreds of thousands of pounds worth of ships, not only for its own use but for other branches of the fruit trade. The story conjures up a romance as big as that of the Charter Companies of the old days of sea venturing. The banana cannot endure the presence of any citrous fruits in a cargo. If bananas are left in an ordinary dessert dish in the presence of oranges or apples, the bananas go black and bad. This is because the oranges and apples “breathe” out a form of acid gas that the banana cannot stand. As a harmless domestic tragedy this is a matter of little or no importance, but its effect upon shipping is far wider, because bananas and oranges cannot be carried in close proximity in ships. The difficulty has not arisen until recently, because, compared with the banana, the grape-fruit and the orange are newcomers. The fruit transport business falls under two main heads - bananas and citrous fruits. Geographically, the divisions are many, for the majority of bananas reaching the European market are from the Caribbean, their original source, and from the Canary Islands. Apples come from Australia and Canada and also from California, where grape-fruit and oranges grow. South Africa is now an important exporter of oranges and grape-fruit, and of deciduous fruits such as grapes, plums and peaches. SLEWING ROUND to enter the East India Dock, London, where the cargo of bananas is discharged. 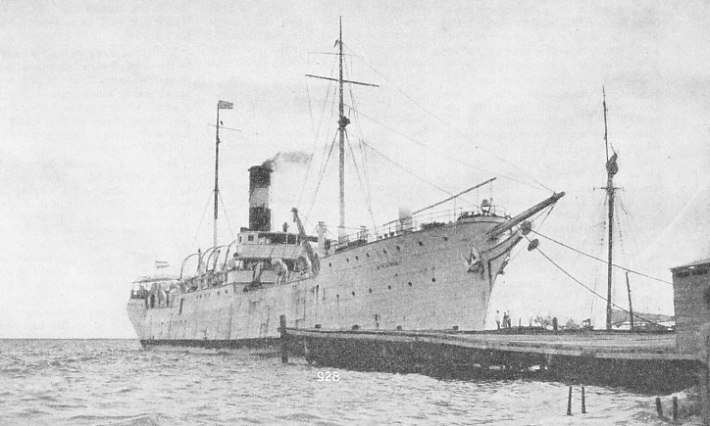 The Jamaica Settler was built in 1910 at Birkenhead as the Highland Laddie, and originally designed as a meat carrier. She was a vessel of 7,256 tons gross, with a length of 405 ft 9-in, a beam of 56 ft 1-in and a depth of 34 ft 7-in. She was sold for scrap in 1935. In addition there are many local grades, some of them of no little importance, such as that between the Fiji Islands and Australia. The Mediterranean, too, is a fruit source of increasing importance - mainly for oranges and lemons. Owing to the relatively short distance of Mediterranean ports and of the Canary Islands from north European discharging ports, and as the Levant harbours are not in a tropical zone, the design of the ships carrying Canary bananas or Jaffa oranges need not include refrigeration. The fruit holds are cooled by what is known as surface ventilation from large cowl ventilators on the deck, or by fans drawing their air from the deck and distributing it over the holds through light steel trunking. This is quite satisfactory even although the conditions for carrying bananas are so different from those pertaining to other fruit cargoes. Bananas, for example, must ripen during transit, and they require not only different temperatures but also different methods of stowage from other fruit cargoes. They are that rare kind of cargo which can be loaded by an endless belt system with pockets in it and unloaded by the reverse process of a similar machine. Bananas were among the first refrigerated cargoes to be carried generally after the original introduction of refrigeration for meat. Until recently, if a shipping man referred to a fruit ship, he meant a banana carrier. Until that time the refrigeration was more or less of a crude nature, requiring the fitting of machines for cooling air in cooler-houses arranged round the mast bases. Cool air was then fan-circulated throughout the holds and over the bunches stacked in tiers or ‘‘bins”, as they are called. The main difference between the refrigerated banana carrier for long-haul routes, as for instance, from Kingston, Jamaica, to Rotterdam and Liverpool, and for shorter runs, such as from the Canary Islands to Dieppe and London, is the addition of refrigerating machinery for vessels on the longer runs. The contrast between the banana ship’s refrigeration and the meat carrier’s is mainly in that whereas one circulates cooled air, the other cools brine and pumps it in its cooled condition through nests of pipes or grids on the undersides of the decks. Year by year with the addition of more “temperamental” cargoes of fruit to the world’s trade routes, refrigeration processes become more and more scientific. It is possible now, for instance, to control not only the temperature of a hold but also the gas content. Citrous fruits, for example, breathe rather unpleasantly and may taint other fruits with which they come into contact. It is thus an advantage to be able to control the “make-up” of the atmosphere in any given hold space. The spaces are therefore made gas-tight, and carbon dioxide gas can be injected into the chambers or extracted from them at will. Elaborate gas-recording instruments are installed at a central control station for the purpose of this process. BUILT IN 1935 for the United Steamship Company of Copenhagen, the Tunis, 1,450 tons gross, is specially designed for bringing Western Mediterranean fruit to North European ports. In addition, this ship has comfortable accommodation for a number of passengers and her holds are capable of carrying general cargo. She has a length of 270 feet, a beam of 40 ft 4-in and a depth of 26 ft 7-in. All this is part and parcel of the fruit ship, and thousands of pounds are spent yearly upon research for the production of more and more perfect machines for the carriage of the more delicate fruits from South Africa and California. For while the technique of banana carriage is not static, it is older than that of the carriage of citrous and deciduous fruits. As with so many other trades of paramount importance, the citrous and deciduous fruit trade became possible with the develop-ment of the State of California, but only practicable when, immediately after the war of 1914-18, the Panama Canal was opened up to traffic from all over the world. The Caribbean Sea, where many ports and quays had been mouldering into decay, was visited mainly by banana ships from the United States and an occasional cruising vessel. With the opening of the Panama Canal, however, these ports took on a new significance, which was to be intensified immeasurably with the discovery of oil in California and Central America. The magnificent ports of Los Angeles and San Francisco were now open to the world in general and to the Eastern Hemisphere in particular. The Golden Gate was to fulfil its name in every sense of the word. The climate of Southern California is ideal for the production of all kinds of fruit, but it is useless to be blessed by copious production in this world of trade unless producers can get rid of the products which are surplus to their own requirements. Before the Panama Canal was opened this was difficult; neither was the mass-production American mind fully at work in Californian agriculture. The Panama Canal became the outlet to Europe, but there was no refrigerator tonnage available and the produce of the Pacific Coast had to be canned. California even to-day is one of the largest exporters of tinned pears, pineapples, peaches and apricots. Soon after the opening of the canal big cargo liners running from Europe to the Pacific North-West Coast as far up as Vancouver began to supply refrigerator accommodation, in addition to space for lumber, grain and general cargo. In much the same way, too, meat and dairy produce carriers in the Australian trade had made provision for apples, and the big Cape mail liners provision for South African fruit. In 1934 there were completed in a Swedish yard for Norwegian owners three little ships of 3,100 tons deadweight, with a power of 3,800 horsepower on twin screws. They had a speed of 15½ knots in service. With their advent a new ship type was born - the citrous fruit carrier. There was no longer any need of exclusive tonnage for bananas. 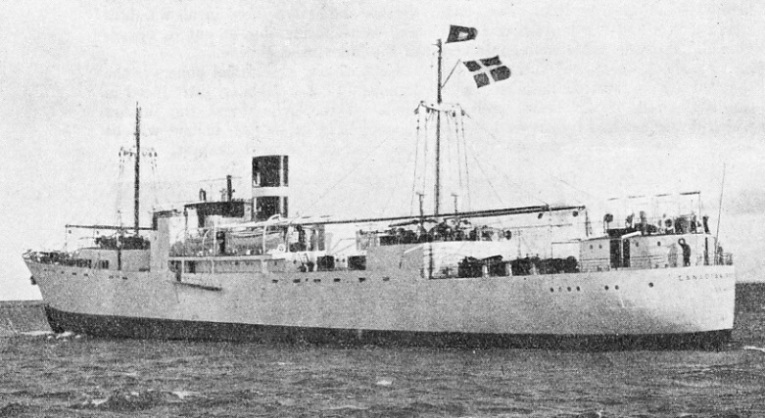 A MODERN DANISH FRUIT-CARRIER, the Canadian Reefer was built for J. Lauritzen of Copenhagen in 1936. 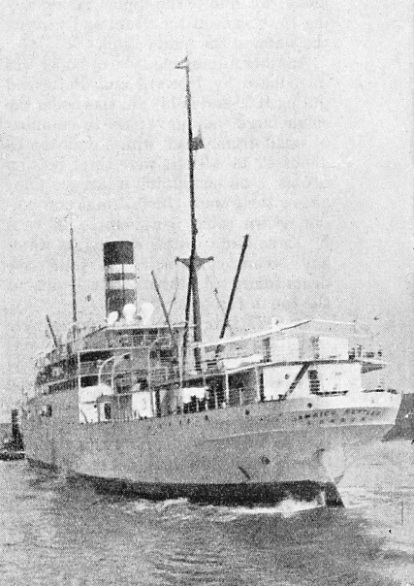 A sister ship, the Chilean Reefer, was added to the fleet later in the same year. These modern motorships have a refrigerated space of about 127,000 cubic feet and travel at a speed of about 14 knots. Since 1934 many such ships have been built. In design they are highly-specialized cargo liners; in purpose they are almost as much tramps as were the old craft which went round the world in pre-wireless days picking up a cargo here and taking it there entirely at the captain’s discretion. Fruit is a seasonal cargo and the modern fruiter, which is so designed as to be able to carry either citrous fruit or bananas, follows the fruit seasons round the world, getting charters now for a voyage, now for a. season, bargaining with owners and growers for the opening up of new routes. The modern fruiter is always speedy and, thanks to modern marine engineering, is likely to become speedier. THE CURVED SUPERSTRUCTURE of the Croisine is a pleasing feature in the design of a modern fruit-carrier. 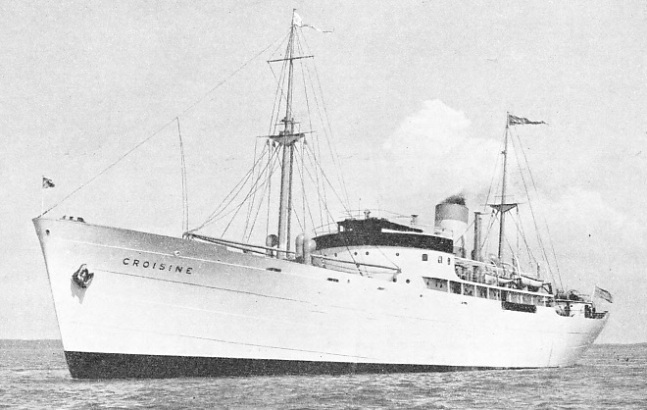 A French ship with a deadweight capacity of 3,950 tons, the Croisine was built in 1936 in Sweden. She was designed for the Mediterranean fruit trade and has a speed of 16 knots. Her length is 308 feet, her beam 56 feet and her draught 24 ft 2-in. The ventilators grouped round the mast are typical of this class of cargo vessel. Such vessels may run one way “light” without fruit, or at the best with as much general cargo as they can pick up. They offer excellent accommodation in rooms, with bath and an excellent cuisine for twelve passengers. A typical fruit-carrier, the California Express has a length of 338 ft 5-in, a beam of 47 ft 3-in and a load draught of 21 ft 3-in. Most of the operating side of this trade is in the hands of the Norwegians, and the building is almost exclusively done by Swedish and Danish yards. One of the largest firms in the banana trade, Elders and Fyffes Ltd, owns a fine fleet of banana ships. This fleet is employed on regular services from Avonmouth, Garston (Liverpool) and Swansea to Jamaica and Trinidad, to other islands in the Caribbean and to the mainland of Central America. One of the larger and more recent vessels on this service is the Toltec, 5,502 tons gross. She is 388 ft 9-in long, with a beam of 53 ft 3-in and a depth of 31 feet. Banana ship or citrous carrier, many of the characteristics are common. Either type of vessel has the largest possible number of decks and the smallest possible number of bulkheads. The ships must be of medium size and have a speed in service loaded of at least 15 knots. The maximum number of decks is necessary because it assists in the carriage of the greatest amount of fruit on given dimensions. The minimum number of bulkheads prevents the fruit space from being split up into small compartments, each with its own problems of ventilation and stowage. Otherwise, in her internal division the fruit ship resembles the oil tanker. In the fruit ship the holds must be gas-tight holds, in the tanker oil-tight. The size of the ship must not be too great because fruit cargoes, and particularly banana cargoes, are often picked up at ports where neither the facilities nor the depth of water exist for a ship of any size. A typical important fruit port is Puerto Barrios, on the Caribbean side of the Republic of Guatemala in Central America. A dirty mosquito-ridden town, it is the railhead for the single-track line (owned by a fruit company) to Guatemala City. On this track the banana trains from the lowlands flanking the Motagua River reach a wooden quay at Puerto Barrios. The quay is at right angles to the foreshore and has a number of wooden sheds containing banana-handling apparatus. The fruit ships lie alongside. Any ship drawing more than about 23 feet of water could not use the port. The modern fast fruiter has two tiers of ‘tween decks underneath the main deck forward and aft of the machinery space amidships. In addition there is a long forecastle, which is sometimes brought aft to join with the centre superstructure to secure extra space for fruit carriage. When this is done part of the forecastle is insulated also. The modern fruiter is streamlined with raking bow and curved superstructure front. A modern fruit ship, the Gap des Palmes, with a length of 330 feet and a beam of 44 feet, has a deadweight capacity of 1,950 tons when loaded down to 18 feet. Her fruit capacity in four holds and ‘tween decks is 153,750 cubic feet. She has a fuel-oil capacity of 442 tons and a normal engine-power of 3,600 on a single screw driven by a diesel engine, which gives her a speed in service of 15½ knots fully loaded. All kinds of machinery are used for fruit ships. Most vessels under the British flag have steam reciprocating engines and Scotch boilers, America favours turbo-electric drive for her combined tourist and banana carriers, where the screws are operated by electric motors. All other nations use the diesel engine. Fruit ships can usually be recognized at sea by their clean modern appearance and grey or white hulls. The great fleets of fruit-carriers are not the least of many interesting ship types. The Caribbean was once the home of buccaneers and men o’ war. To-day, in addition to the regular fruiters, there is a fleet of converted American torpedo-boat destroyers, with guns and machinery removed and part of the old machinery space insulated for the carriage of bunches of bananas. AT KINGSTON, JAMAICA, the fruit ship Virginia is shown in the photograph below coming to her moorings. Built in 1904, and operated by the Standard Fruit and Steamship Company, the Virginia is a vessel of 1,636 tons gross. Her length is 265 feet, her beam 36 feet and her depth 13 ft 9-in.